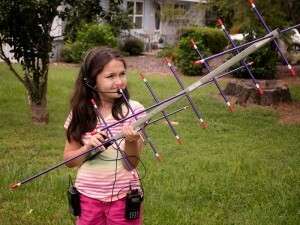 Nine years old...and has already had her first satellite QSO. According to the FCC database, she earned her first Ham license in March of 2015 (at age 8? ), and currently holds a General class ticket. On the other, you may also know, there is under some consideration a move to make your license last as long as you do. Not expiring after 10 years unless you take action. (Unless you expire after 10 years... but is that taking action?) Whether that will happen, whether it would apply to all classes, etc., is unknown. But putting those together people have pointed out that there might be fewer "desirable" calls available to request: Whoever has the call you would really like might just keep on owning it, whether active as a ham or not. So the suggestion was made, take this with whatever sized grain of salt you might want, that if you anticipate going for a vanity call you might be better off to look for one you like, soon. I repeat that I have no extra knowledge about what the FCC will do nor about what effect it would have on availability of calls! Further info will be welcomed. --Ed. In 2017, a new gesynchronous satellite is planned, with Amateur Radio onboard. In effect, this will open up a new ham 'band', according to the ARRL. on Facebook or Twitter. On Twitter, you don't have to join, just enter it into the search field. Comments? Similar hashtags? Just click on 'Write a comment', above. Here's a discussion on gender imbalance in ham radio, written by Dr. Yvette Cendes, KB3HTS, an Astrophysicist. Comments? Similar links? Just click on ‘Write a comment', above. This is a non-technical discussion of some basic antennas, and their erection in less than ideal situations. Note: In Wisconsin, ARES and RACES are combined into one organization.